Being totally candid here, I’ll admit that I scoured lists looking for a good book to pretend was The Book. Just for this blog. That’s the truth. To be honest, I have no idea what book got me hooked on reading. Was it one book? Dunno. Did I have a childhood epiphany? Doubt it. I don’t have a clue when I became a reader, frankly. It just seems I always was. I didn’t have to go too far to find One Book, albeit, I don’t know if it’s The Book. It did stick in my mind. It’s a young one. Technically I didn’t read it, Mom did. 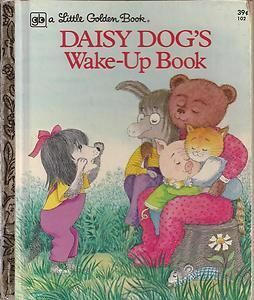 So I’m breaking some of the rules here, but as a young girl, Daisy Dog’s Wake-Up Book by Ilse-Margret Vogel took my love of books to a new level. The story is about a young girl (dog) on her birthday. I got this book on my birthday. How could that not make me the main character? The book was a gift. From Mom. This meant reading was a gift. From Mom. Daisy Dog is bossy. I was bossy. Clearly this was a book that condoned my behavior. These are surface reasons why I loved this book. They don’t necessarily turn one into a reader, but the more meaningful reasons seeped in over time. Being a kid, I felt the crushing frustration of not having control. What the grown-ups said was what went. As a Type A kid, this was annoying. Daisy Dog, however, woke up and got to walk all around her neighborhood telling everyone else to wake up. And wake up they did. She was the boss. This felt like a wake-up call (sorry, but I couldn’t help myself) to the young me; I was seeing it as a chance to be in charge. As a reader, I could be in many different worlds–one where I called all the shots, perhaps–and this was a profoundly exciting idea. For the first time in a book, I read the visuals. The words on items within the pictures created another layer of story. I hadn’t seen or understood this before. It was a delightful surprise, like a secret within an already precious book. Oddly, I never thought to ask my mother if she noticed this or thought the wordplay within the visuals was funny. I thought it was something only a kid would see and get. Again, this opened a new world to me, one where the kids knew more than the grown-ups. That was cool. Lastly, because my mom gave it to me and I was a huge fan of her, I was an instant fan of this book. My mom was this perfect person whom I idolized. She died when I was young, so her memory in things like this book makes it more valuable. I associated Daisy Dog’s mom with mine. She made the best-looking cake, and let her daughter hotshot around the neighborhood on her birthday. She understood her daughter’s needs. Pretty dang awesome. 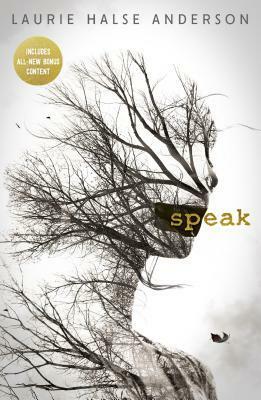 Now, did this book turn me into a writer? Probably not. Although, I knew from a fairly early age that I wanted to write books. Words mattered. Stories mattered. They brought me closer to myself and because of that, I was certain I wanted to create that sort of experience for others. I wanted to write it down and do what Ilse-Margret Vogel did for me: connect me. Free me. Words empower. Words enlighten. In my case with Daisy Dog, words wrapped around me like a soft blanket and reminded me of a special time when I felt understood and powerful, curled up on my birthday morning next to a mom I adored. Stefanie Lyons holds an MFA from Vermont College of Fine Arts. When she's not writing, she's organizing her locker, crushing on boys, practicing her clarinet, or getting ready for prom. In her head, that is. Because her teen years were great. Dating Down is her first novel.